Triangle and parallelogram on same base and between same parallels. If a triangle and a parallelogram are on the same base and between the same parallels, then the area of triangle is equal to half the area of the parallelogram. In the adjoining figure, parallelogram ABCD and ∆ABD are on the same base AB and between the same parallels AF and DC. Here, AB is the base and AE is the height of ∆ABD. 1. If a triangle and parallelogram are on the same base and have the same altitude, the area of the triangle will be half that of the parallelogram. If they have same altitude, they will lie between the same parallels. Hence the area of the triangle will be equal to half that of the parallelogram. 2. If a triangle and a rectangle be on the same base and between the same parallels, the area of the triangle will be half that of the rectangle. 3. 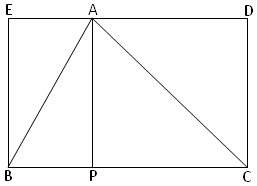 Area of a triangle = 1/2 × base × altitude. ∆ ABC and rectangle BCDE are on the same base BC and between the same parallels BC and ED. 1. ∆ ABD and parallelogram ABCD are on the same base AB. 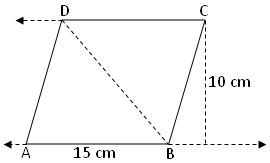 If base and altitude of the parallelogram are 15 cm and 10 cm, find the area of the triangle. ∆ ABD and parallelogram ABCD are on the same base AB.